Microsoft released Internet Explorer 9, the latest version in its browser franchise, late March 14. To say that the company has a lot riding on the browser’s success is something of an understatement. Faced by hearty competition from the likes of Mozilla’s Firefox and Google Chrome, Microsoft needs IE9 to not only capture the hearts and minds of users who would otherwise choose another browser but also persuade those users of older Internet Explorers (such as the increasingly antiquated IE6) to upgrade to the newer version. In addition to increased security and support for various Web standards, Internet Explorer 9 puts the Web front-and-center with an interface designed to minimize (if not eliminate entirely) the presence of toolbars and icons. Many of IE9’s new features and tweaks come courtesy of extensive beta testing, in which some 25 million users participated, followed by a widely available Release Candidate. Microsoft also claims that IE9 provides blazing speed, something that will no doubt prove useful in conjunction with the Web’s increasingly rich content. IE 9’s new security settings work with Windows 7, Windows Server 2008, and Microsoft Office Suite 2010 security settings. With Aero Snap, IE9 users can pin resized windows to either the left or right of the screen, or even “tear off” Website tabs if they want to view a pair of Websites next to each other. IE9’s stripped-down user interface recalls rivals such as Google Chrome, with similar emphasis on putting a Webpage (as opposed to toolbar and icons) prominently front-and-center. IE9 includes extensive support for HTML5, and, for users with Windows 7, leverages the PC’s processing power to run high-definition videos, rich Websites and other media with greater clarity and speed. Users can click and drag a Website tab to the Windows 7 taskbar, pinning it there as an icon. Microsoft’s InPrivate Browsing allows for Web surfing without leaving traces that can be discovered later. Microsoft built this feature in conjunction with the SmartScreen Filter, which judges potentially security-suspect Websites based on their reputation. Once a Website is pinned to the Windows 7 taskbar, right-clicking on its icon will open a menu for one-click access to various parts of that Website. This comes in particularly useful for sprawling Websites such as eBay and Facebook. The combination of translucent, stripped-down user interface, jump lists and “pinned” icons all combine to integrate IE9 thoroughly into the Windows 7 or Vista interface. However, the new browser is incompatible with Windows XP and its sizable percentage of users. 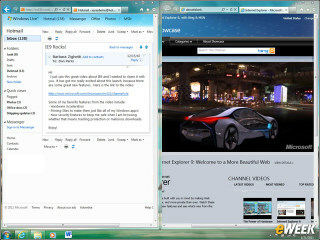 IE9 lets users adjust features such as Privacy and Programs, giving them granular control over their Web experience. With IE9, Microsoft also retained some very familiar elements. Many icons look like slightly cleaned-up versions of their predecessors, and features such as the “Favorites” bar are still very much present. Microsoft hopes that IE9 will allow it to halt or reverse its long, slow erosion in browser market share and serve as a viable competitor to the likes of Google Chrome and Firefox.